James Stott was born in Belfast, Ireland on November 11, 1830. His parents brought him to New York when he was just over a year old. Stott married Minerva Willard before the war; they had three chldren. He was farming in Greenwood Township, McHenry County, Illinois when Merritt Atwater signed him up with George Wentz's company of recruits; the company became Company G of the Fifty-First Illinois. Once in the field, Stott was often detailed as regimental teamster. He was nearly always on duty with the regiment, only on two occasions away from the regiment—absent with leave. 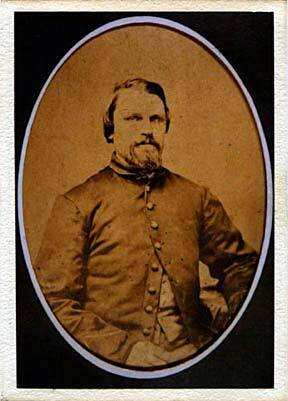 He reenlisted in December, 1863 when most of the members of the regiment reenlisted, and was mustered in, as a veteran, at Chattanooga on February 8, 1864 for another three years of service. He was mustered out of the service on September 25, 1865 in Texas, having served with the regiment from its first to its last official day. After the war, Stott's first wife Minerva having died, he married Sophia Wilcox, a widow, in 1866 at Petersburg, Illinois. They had two children. The Stott family moved to Bevier in Macon County, Missouri, where Stott worked as a coal miner. State of Missouri death records indicate that he died on January 10, 1884, "crushed by rock". 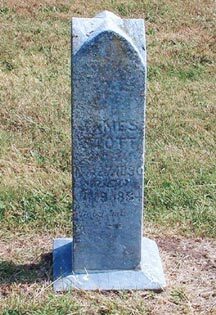 Stott was buried in St. Charles Cemetery in Bevier, Missouri. The marker shown at right marks Stott's grave. Know ye, That James Stott a Private of Captain Merritt B Atwaters Company G, 51st Regiment of Illinois Vol Infantry VOLUNTERS who was enrolled on the Twenty Fourth day of December one thousand eight hundred and Sixty One to serve Three years, or during the war, is hereby Discharged from the service of the United States this Twenty Fifth day of September, 1865, at Camp Irwin Texas by reason of Special Field Order No. 1 Maj. Gen. Wright. Said James Stott was born in Belfast in the State of Ireland, is Thirty Four years of age, Five foot eight inches high, light complection, Blue eyes, Brown hair, and by occupation, when enrolled, a Farmer. Given at Camp Irwin Texas this Twenty Fifth day of September, 1865. *This sentence will be erased all together if there be anything in the conduct or physical condition of the soldier rendering him unfit for the Army. 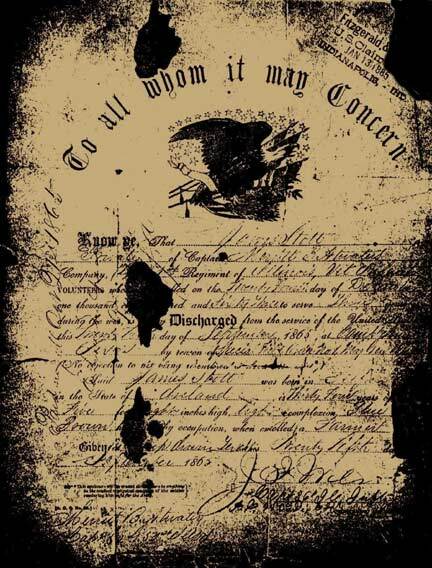 Discharge paper, courtesy of Justin Kaiser, husband of Maryellen Aylward Kaiser, Stott's great great granddaughter. Family genealogical information, compiled service record, and cemetery marker photograph courtesy of Stott's great great grandson Paul Cook. James Stott, Compiled Service Record, 51st Illinois Infantry, Records of the Adjutant General's Office, 1780's-1917, Record Group 94, National Archives and Records Administration, Washington, D.C.
James Stott photograph, courtesy of Stott's great great grandson Jim Brown.